EU Amazon workers are winning the fight against exploitation. Could the UK be next? Amazon Italy has finally agreed to work with unions, Spanish fulfilment centres are on strike, and German workers have erupted in protest. Amazon.co.uk is next on the line. Amazon workers in Italy are celebrating a landmark victory, as the local front of the ecommerce giant gave in under union pressure and agreed to end inhumane work schedules. The agreement between Amazon.it and workers’ representative unions is a first in the entire company’s history. Amazon is infamously known for its anti-union policies and victimisation of organised workers. Italian unions working with Amazon have guaranteed an end to unfair scheduling by reducing the number of mandatory night shifts. Volunteers for night shifts will also be considered first, and the night hours salary compensation has been increased by 25%. Weekend work was also distributed more fairly, with workers guaranteed four consecutive weekends off every eight weeks. Shifts also need to alternative between Saturdays and Sundays. Unions organising Amazon workers now hope the Italian agreement, which sets on on June 17, will set a precedent for the rest of Europe. Amazon has faced several campaigns from both its workers and civil society organisations, demanding the company ends its long hour shifts, punishing performance targets and draconian workers’ management. Earlier this month, 1,000 workers in an Amazon fulfilment centre in southern Spain walked out over the exploitation of temp workers and the “overreliance” of the company on zero-hour contracts. Spanish trade union CCOO, which represents the workers, also filed a lawsuit against Amazon during the strike. Amazon.es CEO, François Nuyts, stepped down from his role a day before the strike allegedly to explore other business challenges. In April, the picket lines came to Amazon centres in Germany and Italy, while Amazon workers from across Europe assembled in Berlin protesting Amazon founder Jeff Bezos being awarded a “business innovation and social responsibility” prize. Said they would not apply for a job at Amazon again: 81%. In Britain, Amazon workers are also organising against poor working conditions, after a survey by the Organise campaign, found that over half of fulfilment centre workers were suffering from depression. 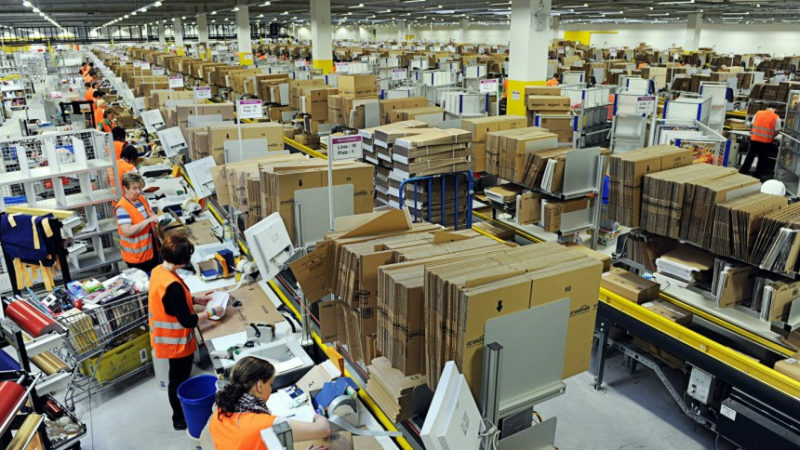 The damning report also found that over 80% of Amazon workers in Britain would not apply to work for the company again, with 74% retelling how they avoided going to the toiled while at work in order not to affect their strictly-monitored performance. Some of the workers surveyed also said they had considered suicide since starting to work in Amazon warehouses, with nearly 60% saying they had become a lot more anxious. Could Amazon deliveries be grinding to a halt in Britain soon?